Start at the top of the page with a combination of the following colors: Cerulean Blue, Cobalt Blue, Winsor Yellow and Burnt Sienna, just putting the colors down and letting them mix on the paper. As you come upon the flowers start using the local hues to shape in the flower. 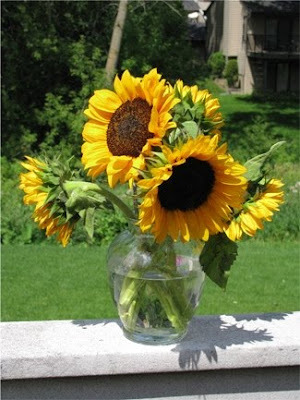 Use Burnt Sienna for the middle of the flowers. 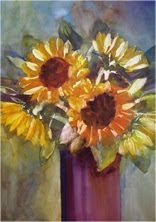 Alizarin Crimson and Cobalt Blue are used in the vase. Afer the shine is gone on the paper, use a credit card (the side of the card) to scratch out some petals and stem and foliage areas. Let dry. Going in now with the middle values, using Gambage to develop some of the petals, Winsor Yellow and Winsor Red are also used. Ultramarine Blue and Burnt Sienna are used in the middle of the flowers. Darken the side of the vase with the same colors used above. Develop some foliage areas around the flowers. Let dry. Our final wash will consist of values that are the darkest on the value scale. 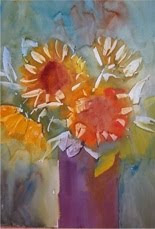 Using Burnt Sienna, Winsor Green and Alizarin Crimson, indicate some texture on the centers of the sunflowers. Using the same dark indicate some dark shapes around the sunflowers, using the value sparingly, painting negatively around some of the petals. I put clean water on the vase and overlaid the same colors but tried to smooth out the values. 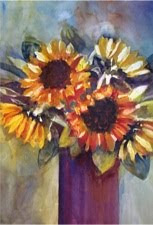 The colors around the sunflowers consist of Alizarin Crimson and Gamboge. 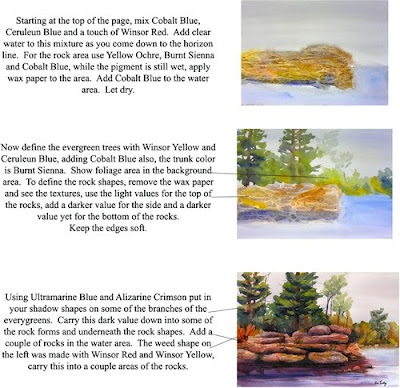 Start at the top of the page with a combination of Cerulean Blue and Cobalt Blue for the sky area. Using the same blues add Winsor Yellow and make some tree shapes, sculpt out around the buildings, leaving the white of the paper. As you go down the page introduce Winsor Yellow and Winsor Red to make an array of oranges, adding Alizarin Crimson at the bottom. The water consists of Cerulean Blue and Cobalt Blue, using more pigment at the bottom of the page. Let dry. 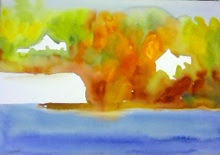 Now using your middle values repeat the same steps as above, but use more pigments and less water to get a darker value. You are going to start giving the colors shapes, with negative painting (painting behinds the shapes). 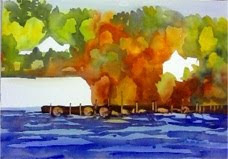 Indicate the dock area with Burnt Sienna and Ultramarine Blue. 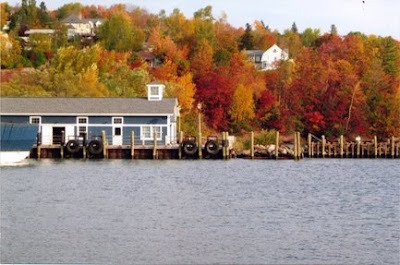 Use the side of a credit card to scratch out the posts and tires on the dock. 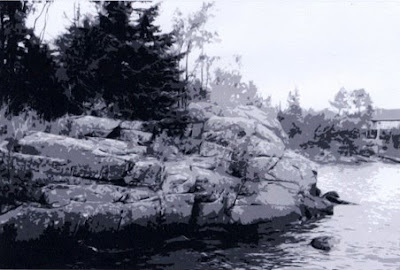 Using Cobalt Blue and Ultramarine Blue indicate some line work in the water with smaller shapes further back and larger shapes as you come forward. Let dry. Now using our darker values go in and define a couple of shapes in the foliage area. Using Burnt Sienna and Ultramarine Blue paint the roofs on the buildings, adding windows. 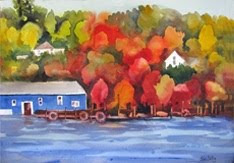 Cobalt Blue is used on the boat house, painting around the white shapes. Then add Burnt Sienna and Ultramarine Blue for the window areas. 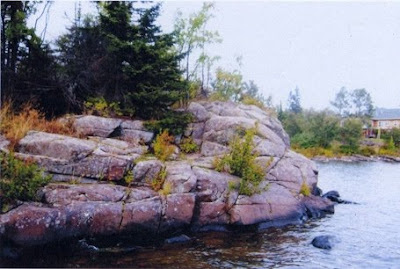 I soften the edges of the water by using a large flat brush with clean water and going over the entire area a couple of times.